Imagine working on the same Web page for 12 years – for most design and/or testing professionals, that concept isn’t much of a stretch. Optimizely CMO Jessie Becker essentially did just that in her dozen years at Netflix before joining Optimizely, where she and other colleagues tested everything one could possibly think of – from movie rating systems to shipping algorithms. When looking back, however, what she really did was work on one page – the homepage, the page that everyone sees when going to Netflix.com - for 12 whole years. The concept of today’s Netflix homepage (see image below) is similar to what Becker, who gave the keynote presentation at the Optimizely Experience in L.A. this week, tested for so many years – a family watching content, there’s an offer, a little how it works and what kind of content the user is going to get. Simple enough, right? Becker knows what it took on the engineering side to build that outwardly simple test. The homepage – and all the testing that occurred and continuously occurred - is essential and was essential for building Netflix’s business. Especially in the early days when it was going against the likes of Blockbuster or later on, when it needed to explain the concept of streaming video. 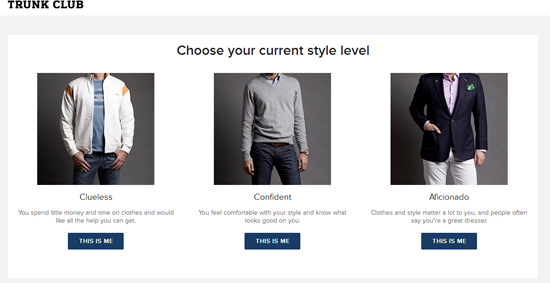 Likewise the Trunk Club, which is a men’s clothing service where a personal stylist hand picks a trunk of high-end clothes and ships it to users for free, is hoping its testing of its sign-up process continues to pay off. Using Optimizely, the Trunk Club went against conventional wisdom that sign-up forms are better with fewer clicks. Instead, they dared to go from just two steps to six steps. They redirected 50 percent of traffic to this test and saw 133 percent more customers as the result. This is likely due to the fact that now the information was smaller and more digestable for a business concept that is pretty out of the box (err…trunk). This onboarding project yielded 20,000 more customers in 2014 and made a huge impact on the company’s bottom line from going from a two-step sign-up process to six steps.